Morten Arneson was a nurseryman on Excelsior Boulevard, but much more than that. He was instrumental in the creation of the St. Louis Park Medical Center (now Park Nicollet) and he was an extremely active participant in civic matters in the Park. Arneson was born in Norway in 1893 and kept his Norwegian accent for life. He came to Minneapolis in 1912 and worked as a landscape architect for the Minneapolis Park Board, where he was the head of the flower department for 17 years. In May 1929 he bought three acres on Excelsior Blvd. and Quentin Avenue and established his nursery business at 4951 Excelsior Blvd. He probably bought the property from Warren C. Fletcher, who at one time had over 9 acres. Arneson and his wife Katharine lived in a little white house on Quentin, and the business operated out of a 4-5 car garage. In his memoir, Arneson described the lawless atmosphere on Excelsior Blvd. once beer was legalized. There were a reported 14 honky-tonks on the strip. He told of one particularly hot night when the racket was worse than ever; the band in the joint across the street (probably Walt’s Canteen, across Quentin) played three pieces on the banjo, one after another, and when they were through they started all over again. Finally, the family departed to a friend’s house way out of town to get some sleep. He suspected the Kid Cann gang and the police (and possibly the Park Mayor) of being in cahoots. Regardless, although the law that required establishments to close at midnight, it was not enforced, and those who complained were told to go back to Minneapolis if they didn’t like it. For more on this sort of thing, see Liquor in the Park. Arneson and others worked to elect Village officials who would crack down on the bars, and formed the Better Government League. In 1951, Arneson leased part of his land to the founding doctors of the St. Louis Park Medical Center on terms they could afford, thus allowing them to start the clinic. For more information about this very important aspect of the Arnesons’ lives, see Park Nicollet. 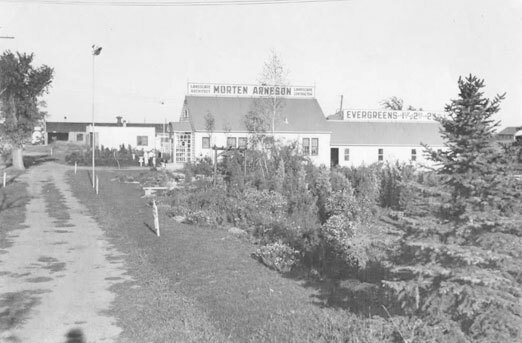 On his remaining St. Louis Park land, Arneson built a grocery store at 4951 Excelsior Blvd., on the corner of Excelsior and Quentin, in 1953. That building was later purchased by the burgeoning SLP Medical Center and is now the Park Nicollet MRI Imaging Center. Nephew Al Arneson was born on July 22, 1918, three months after the death of his father, Albert A. Arneson, who was Morton’s brother. Al’s mother was Mrs. Elizabeth Arneson. Al was raised by Morten and Katherine, and many held the mistaken believe that Al was their son. Al attended Brookside School and was captain of the football team at Park High, graduating in 1935. He studied architecture at the U of M, graduating in 1940. In 1941 he earned a Masters at Harvard and went to work for General Housing, Inc. He trained in the theory of bomb damage to structures at Princeton and when World War II broke out he became an operational analyst with the 13th AAF, analyzing targets and determining their vulnerability. This work didn’t require him to take part in battle, but he requested permission to take part in order to analyze the effects of air attacks. He died on May 5, 1945, of a head wound in Tarakan, Borneo. He was survived by his aunt and uncle, mother (listed as of Lindley Hall, Minneapolis), and a sister, Mrs. Astrid McCleave of New York City. In 1953, Morten and Katherine built a house at 4709 West 70th Street in Edina, on 20 acres they had been using to grow nursery stock. Against pressure to subdivide, he donated his property to the City of Edina for use as a City park. Katherine passed away in 1972, and Morten passed away in October 1982. Their house is now being used for the Edina Historical Society. The tree farm is preserved as Arneson Acres. We’re told Morten’s ashes are located in an unknown location on the property. The image below is a photo of a portrait displayed at the Edina Historical Society.